Randall-Reilly / Digital / How Important is a Landing Page? A landing page is where a visitor “lands” after clicking on an ad or link in your campaign. With that definition in mind, imagine a prospect drifting through the internet as someone without any connection or devotion to you or what you offer. A tinge of interest causes them to click on an ad in your campaign. That drifting prospect “lands” on a web page, but the only way they can firmly “plant their feet” on that page is to take action. So they have to see something that makes them want to take action. Need I say how important this makes the page they land on? Before we dive deeper into the importance of a landing page, I’d like to distinguish the specific type of landing page I’m referring to by taking a quick look at some of the common types of landing pages and their purposes. A splash page is a precursor page for a website or content page. The simple page usual contains very little text, an image, and usually a link leading you to the next page. Its purposes include promoting a product teaser-style, noting a company update, giving a disclaimer, or even displaying a quote like Forbes.com’s quote of the day that comes up when you’re clicking through their website. A squeeze page’s sole purpose is to capture a prospect’s email address. This type of page gets email addresses in exchange for content e.g. a newsletter, e-book, podcast, slide deck, etc. Squeeze pages are usually very direct containing an image, concise text that tells of the page’s purpose, and a CTA that asks for the email address. The click-through landing page pre-empts the credit card form. It’s main aim is to lighten the process leading up to the impending request for a prospect to spend money. It usual contains an image, enough information about the product, service, software, etc. to educate you on what you’re purchasing, and a link to get to the credit card form. A sales lead capture landing page is designed to lead a prospect to a sale. Its content is usually tailored to be more persuasive and educational, because its end goal is to keep the prospect clear on the offer (this type of landing page is usually more lengthy than other options). This is the landing page type that will be addressed in this article. It’s sole purpose is to turn a prospect into a lead. One of its most important features is its form; and the form plays the most important role of capturing the prospects information. Your lead capture landing page should be tailored to capture the type of leads your company works best with. For example, if calls are your company’s strong point, then a trackable phone number should be included. When going over the flow of your campaigns, it may seem to make sense to have ads lead to a corporate website, right? It’s where a prospect can learn about you and what you offer in detail. Your website also gives a prospect access to your content, resources, solutions, ways to contact you, and the list could go on. The question is. . . upon reaching the end of a campaign, do you want a prospect to have such a long list of options for how to interact with you?—many of which do not guarantee their becoming a lead. Or do you want to keep a prospect’s focus on the goal of the campaign? If your answer is the latter, then a website may not be the best choice. 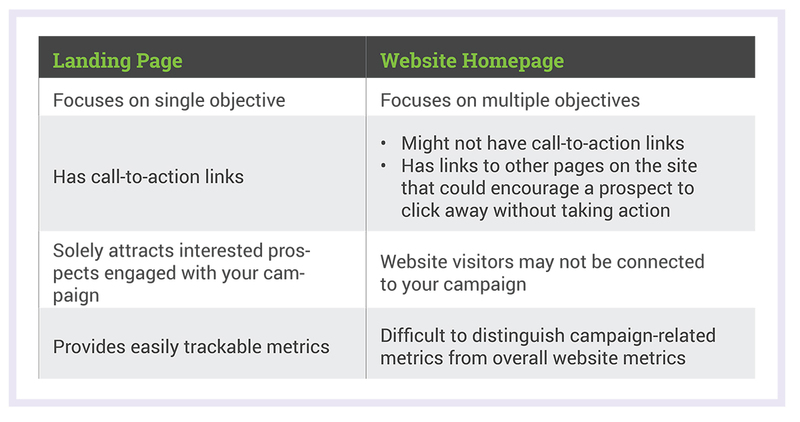 We’ve seen evidence of how a landing page performs better than a website homepage in our own campaigns. For one of our clients, we directed traffic to a landing page built specifically for their campaign. Wanting to improve even further on the campaign’s performance, the client requested all traffic be directed to their website homepage. This change lasted for a month. There were other disadvantages brought on by the change. Because their website homepage didn’t have a form readily available for a prospect to fill, it took searching and numerous clicks to reach the form, increasing the chance of losing a prospect along the way. Despite that, you may have noticed the increase in forms in the month of August. This was due to Facebook lead ads and our Careers in Gear website which we added to the campaign to make up for the drop in forms. It was through these channels the 1,030 forms in August were produced. Another disadvantage was that the phone number and form through which prospects converted on their website was not built by us. Thereby, preventing us from tracking the results, tying them to the campaign, and using those metrics to improve on the campaign. Now that we’ve looked at the importance of landing pages, let’s take a look at a few best practices to build your landing pages around that may seem to be no-brainer, but are often overlooked. Landing pages with multiple offers get 266% fewer leads than single offer pages. That is a considerable gap. The beauty of a landing page is its ability to drive a prospect toward one sole purpose. . . taking action. What is the action you want the prospect to take? Do you want a prospect to fill out a job application for your company? Do you want them to buy a product? Or sign up for one of your services? Asking them to do all those things at once could dissuade them from taking any action at all. A prospect wants to feel your campaign caters to their direct need. Ending up on a landing page with too many offers or objectives doesn’t convince a prospect you know what they as an individual want. Something important to consider is the prospects visiting your landing page are at different stages of the buyer’s journey. To cater specifically to each of these stages, you can incorporate personalization. Powered by smart lists and lifestyle stages, you can tailor smart CTAs to prospects at specific stages in the buyer’s journey. For example, providing an educational piece for new prospects and a way to interact with you to returning prospects e.g. consultation. You can take personalization on your landing page even further. For example, greeting a returning visitor with a “welcome back” message or having a list of suggested products for them based on previous purchases. Smart Content provides a way for you to show a prospect you’re aware of them as individual and are able to cater to their specific need. This is important because there are some prospects who intend to have no more than a glance at your landing page before steering away to another page. These prospects will not scroll down. Even for the ones who scroll down, they look at more above the fold. So you have to consider what you want these prospects to see. So what needs to be above the fold? Image or video of product or clear concise description of service, job offering, etc. I’m not suggesting you put everything above the fold. Only what’s most important when it comes to convincing a prospect to take action. Also, designing your page in a way that makes it obvious there is more to see below the fold can invite a prospect to scroll down. Stay away from clutter. A prospect’s only going to skim through your page anyway before they decide if it’s important enough to spend anymore time on or not. So make it easy for their eyes to catch important information. If a prospect’s eyes can’t find a focal point on your page, you’re making it all too easy for them to steer away. Keep your design and brand colors consistent throughout the campaign. Let it be easy for a prospect to visually tie an ad to the landing page they land on. It helps them know they’re in the right place when they reach your landing page. If you’re worried you don’t have the design strength to pull this off, then keep your design simple. Those were only things to keep in mind when creating landing pages for your campaigns, but they’re a great start. Incorporating these best practices could all the difference when it comes to getting a prospect to take action.